This auction was won by s***0. Enjoy a 3 night stay for 2 guests in a Hardwood Suite (either the Marula or Jackalberry Suite) at Khaya Ndlovu Manor House, Hoedspruit, South Africa. Stay includes: daily dinner, breakfast and a light lunch; 2 daily game drives or bush walks per day on the Khaya Ndlovu Manor House reserve. Stay is valued at 22,410 ZAR / $1,600 USD / £1,220 GBP* (and includes 15% VAT). Please note all additional purchases including further meals, drinks, spa treatments, airport transfers, extra activities and excursions etc. must be paid for by the winner separately. Auction stay dates: to be booked in advance and taken before 30 November 2019, excluding stays between 15 December 2018 to 15 January 2019 and 01 to 30 April 2019, subject to availability. 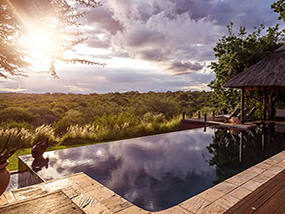 Khaya Ndlovu is situated in the Khaya Ndlovu Game Reserve, surrounded by nature, but only a stone’s throw away from Hoedspruit, the gateway to the greater Kruger, a wildlife haven of the Limpopo Province of South Africa. It offers a true home away from home experience, where you set the pace of your own holiday, working only to your relaxed deadlines. The core of the property, the Manor House, is situated in the northern section of the reserve overlooking the splendour of the famous Blyde River Canyon, the third largest and undeniably most spectacular canyon in the world. The dining and pool deck, bar area as well as various lounges are at your disposal to use at your leisure. Festooned with a collection of original artworks, diverse in genre, complemented by an abundant assortment of Persian carpets dressing the floors, the Manor House exudes a luxurious and exotic ambiance. Guests will enjoy a truly authentic safari experience under the guidance of the property’s knowledgeable game guides. It’s not about racing from one sighting to another at the summons of a faceless, crackly voice on a radio, instead it’s about the guides intuitive instinct in locating and tracking down those exciting animals in their natural environment. White rhino and the fiercely guarded black rhino are amongst the big three that they can proudly show you, whilst rare and quirky wild dogs are a regular find. And of course; Gin and Tonics below a setting sun or a steaming Amarula hot-chocolate or coffee on a morning drive, are on the non-optional extras list! The luxury, colonial style Hardwood Suites are situated within the Manor House and all have sweeping views of the tropical garden and external verandas, which can be directly accessed from the rooms. The resident garden monkeys provide much entertainment with their acrobatic displays amid the branches of the towering trees, sharing their glorious playground with a multitude of chattering bird species. The winner and their guest will be staying in either the 20sqm. Jackalberry or Marula Suite. Both offer elegantly furnished, classic bedrooms housing an inviting king size bed, which may be split on request, plus access to the garden terrace. Both feature an ensuite bathroom and full length windows and doors, providing access to the garden terrace. Amenities include: cotton linens, fully serviced, hairdryer, coffee station, mosquito nets and safe. Luxury Travel Diary terms and conditions apply. *This auction item is valued at approximately 22,410 ZAR by Khaya Ndlovu Manor House, Hoedspruit, South Africa – please note this valuation is the list price provided to Luxury Travel Diary by the Auction Prize Provider and should be used as a guide only as cheaper discounted rates may be available. No cash alternative is available. This auction item excludes flights and transport – you will need to arrange your own flights / transportation to and from your home to Khaya Ndlovu Manor House, Hoedspruit, South Africa to coincide with your booking. Your stay is subject to availability, must be booked in advance and taken before 30 November 2019, excluding stays between 15 December 2018 to 15 January 2019 and 01 to 30 April 2019. Please note any associated taxes / resort fees / entrance fees etc. and all additional purchases will be collected from the winner by the relevant property at the time of booking your stay or on departure and will not be deducted from the amount bid for the item. Winners must pay for their auction item in full via PayPal within 48 hours of the auction end. The full Terms of our auctions can be found here. To the fullest extent permitted by law, Luxury Travel Diary will not be liable for any loss or damage arising out of the winners’ use or enjoyment of the prize; and the winner acknowledges that Luxury Travel Diary accepts no responsibility whether directly or indirectly for any claims whatsoever arising in respect of the prizes provided by third party providers or sponsors.